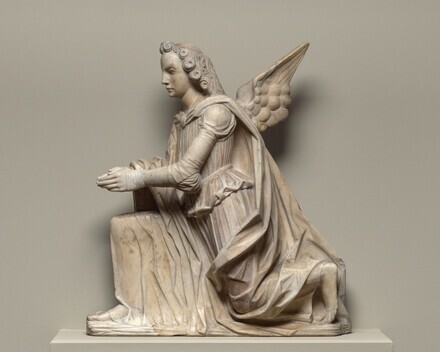 Sculptures of the Italian Renaissance, A.S. Drey Galleries, New York, 1935, no. 39. Obras Maestras de la National Gallery of Art de Washington, Museo Nacional de Antropología, Mexico City, 1996-1997, unnumbered catalogue, 32-33, color repro. Preliminary Catalogue of Paintings and Sculpture. National Gallery of Art, Washington, 1941: 218,no. A-25, as by Giovanni Antonio Amadeo (or Omodeo). Book of Illustrations. National Gallery of Art, Washington, 1942: 253, repro. 224, as by Giovanni Antonio Amadeo (or Omodeo). Paintings and Sculpture from the Samuel H. Kress Collection. National Gallery of Art, Washington, 1959: 416, repro., as by Giovanni Antonio Amadeo. European Paintings and Sculpture, Illustrations. National Gallery of Art, Washington, 1968: 129, repro., as by Giovanni Antonio Amadeo.